>> What Nutrients Are You Actually Getting Out Of Your Thanksgiving Dinner? Thanksgiving is a day set aside to celebrate all the bounty we have in life. Many have the tradition of sharing what they are most grateful for. Some are grateful for their families, some for their careers, and other for their dog. By the end of it, everyone is just thankful to finally dig into their food. One aspect of life people often forget to be thankful for is their health. Good health is often taken for granted until illness inevitably comes. Whether the illness is a cold or cancer, it is something to avoid. This makes good health a thing always to be thankful for. As you prepare for Thanksgiving, be conscious of your health. Many people are deficient in essential vitamins and minerals. Two big ways deficiencies occur is through lack of exposure to nutrients and lack of absorption. On Thanksgiving there is so much food that exposure most likely isn’t the problem. But your body still may not be absorbing it well. Nutrients from food does tend to be more absorbable, but you can increase the absorption by being aware of what vitamins and minerals aid in absorption. Most vitamins and minerals have a complimentary nutrient that increases their absorption. We have compiled some of the key nutrients you will get from turkey, stuffing, and yams and what their complementary nutrient is. Turkey* provides iron, potassium, phosphorus, and B vitamins. 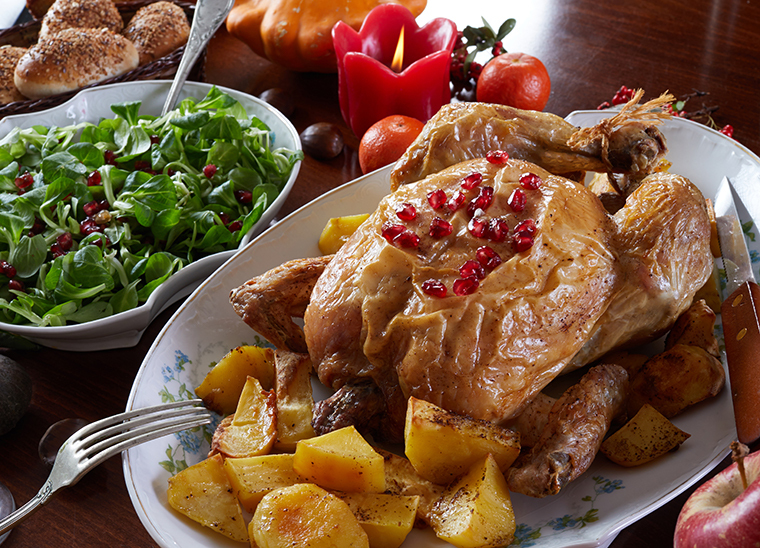 When eating turkey, be sure to include vitamin C, magnesium, vitamin D, and other B vitamins. Another important aspect of food is to monitor how much of the three macros you are consuming. Turkey primarily provides protein. Protein is necessary for muscle development and strength. Keep in mind that you need fat and some carbohydrates as well. Stuffing consists of many elements, primarily carbs. In fact, many types of stuffing are about 50% carbs. Some also can have a good amount of fat, which is the best of all the macros. The main nutrients stuffings offer are selenium, sodium, vitamin K, and folate. To increase the absorption of these nutrients, include vitamin E, potassium, vitamin A, and vitamin B in your meal. Whether you prefer yams or mashed potatoes, both are starchy vegetables, so they offer mostly the same nutrients. Some primary vitamins and minerals in yams* are vitamin c, potassium, and B vitamins. The minerals that increase their absorption are iron, magnesium, and other B vitamins. All starchy vegetables are mainly carbohydrates. These foods tend to be the main components of a Thanksgiving feast. The vitamins and minerals that will increase the absorption of these foods’ key nutrients could be included in other foods in the meal. But whether you intentionally include foods with those nutrients, you will not know if the other foods have the nutrients you need without a little research. An alternative is to use supplements. They can easily be taken before or after a meal to increase the absorption of the vitamins and minerals in the meal. *This nutrient list does not include spices or sauces that may be served with the turkey and yams.